YUM! 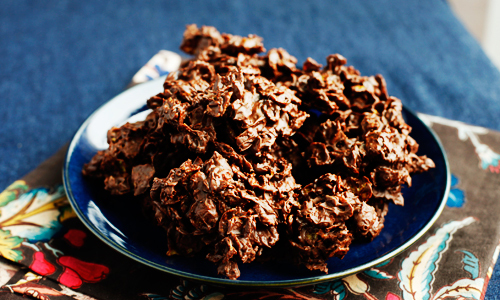 I second the Fiber One haystacks..they are delish! My kids love them! 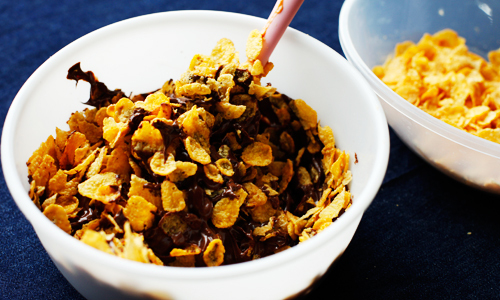 I didn’t have cornflakes but really wanted to make these today so I used Special K. Delish! These look so good, Alice. And I love how you put them with the blue background—a perfect complement. Welcome back!!! These look delicious, and fantastically easy! Thanks for sharing! 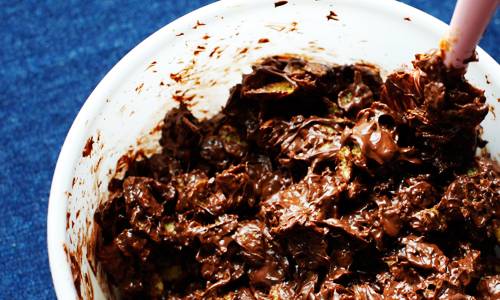 I have a crazy craving for chocolate right now, and I think this might just do the trick! I love how simple your recipes are, and I love the picture of your kids helping you bake! But next time, you should also include a picture of you beating your girls in Just Dance 2. 🙂 I think your readers would like to see that. Just Dance 2 rocks! My girls say I have a few moves left too. 🙂 I have made this recipe with oatmeal and it is pretty tasty. One can never go wrong with chocolate and PB! The chow mein noodle version of these was a staple in my house growing up. This sounds like a wonderful variation! Yum! 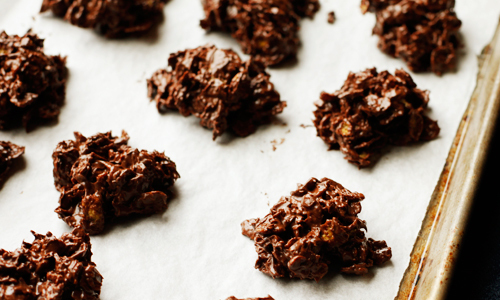 These remind me of no-bake cookies my mom used to make, but they are SO much easier… Love it! 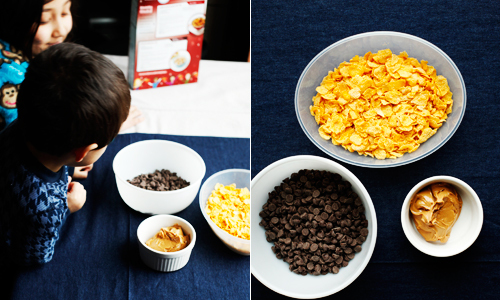 If I had cornflakes in my pantry, I’d totally be making them right now. I have to go check to see if I have rice krispies… I’m thinking they might work, too. Yay for some lazy fun times! I can totally relate… I was playing Wii resort with my 6yr old, sword play and had to totally play with no holds bar, take no prisoner attitude b/c the kid was beating me up. So fun! It sounds like you’re having a great week with your girls. There’s nothing like being active and silly with kids! These stacks are perfect for an easy treat. Simple food is quite often my favorite. Honestly, you can’t go wrong with chocolate and peanut butter! Yum! These look SOOOO GOOD – and the perfect treat your kids can help with too!!!! If I make these with bran flakes, will they qualify as health food? Happy to see you blogging here again. I miss your great recipes and photos. Yum! These look great and I love how easy they are. Love this simple recipe. My sister-in-law loves to make the chowmein butterscotch haystack/birdsnest, but it’s too sweet for me. 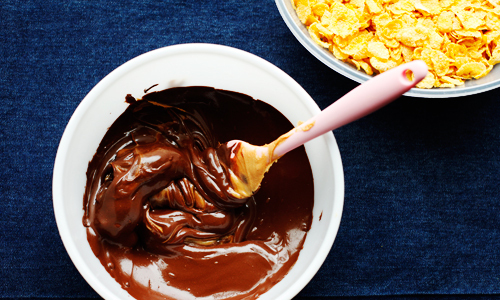 Chocolate and peanut butter, that I like, and over corn flakes. This is great! No need to buy those noodles that I don’t usually eat! This looks soo good…Glad to see you’re back!! Who doesn’t love a ridiculously easy recipe? Especially when it has chocolate and peanut butter! 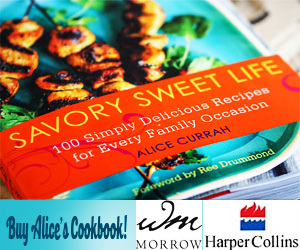 Hi Alice, im so happy tohave found ur blog as i was searching for buttercream frosting. ur work is absolutely perfect and u teach very well too. please do more tutorials for us. Could u plz give us a perfect cream cheese frosting recipe that is firm enough to pipe rose swirls with . i made one using philiadelphia’s cream cheese but it was spreadable version . it was ok but i cudnt only frost with it but cudnt decorate with. oh oh! toss in pretzel and potato sticks for a real wacky taste combination that you CANNOT RESIST EATING.